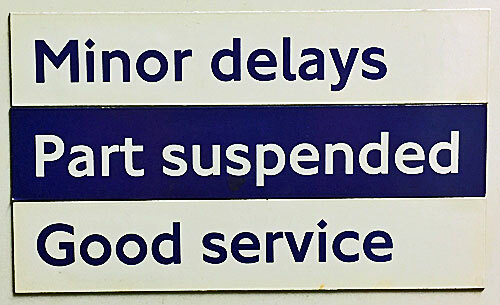 If you've ever found yourself sitting on a delayed tube train while a loudspeaker on the platform booms out "There is a good service on all lines", you may have wondered what the hell a 'good service' actually means. TfL have an official definition as part of their Service Status Criteria, a set of documents which has recently been revealed through a Freedom of Information request. As you might expect, it's complicated. First of all, as you probably know, a sliding scale of delay and disruption exists. Suspended is the worst, then Part suspended, then Severe delays, then Minor delays, then Good service. Good service is the default if none of the others have kicked in. "When an incident occurs that results in the service coming to a stand for a period that is likely to be five minutes or less, an initial service alert (ISA) may be issued. Where an ISA is issued, minor delays will be declared automatically if there is no train movement after the five minutes has elapsed. The start time of an ISA is wheel-stop time or incident start time." Sometimes the incident which caused the Initial Service Alert goes away quickly, and the public are none the wiser. But if the clock ticks past five minutes, 'Minor delays' kicks in and the new status is broadcast to the world. The rules for what counts as a delay vary from line to line, and are usually different in peak hours to off-peak. To keep things really simple, let's start off with the Waterloo and City line. With only two stations, it all comes down to what time it is and whether trains have been cancelled or not. At the height of the rush hour it only takes a single cancelled train for the W&C to exhibit Minor delays. It takes two trains to hit Severe delays, whereas at other times two cancelled trains is only enough for Minor delays. No trains at all for quarter of an hour, or an unfortunate incident, is enough to escalate the official status to Suspended. The Circle and Hammersmith & City lines are the next simplest. Four different factors are now in play to determine the status of the line - the intervals between trains, the speed of trains, the length of time trains have been stopped and the percentage of scheduled trains in service. Someone in the control room is checking all these conditions, and as soon as one is triggered the appropriate line status is declared. Trains on the Circle and Hammersmith & City lines are generally timetabled ten minutes apart. One cancelled train triggers nothing, despite leaving a 20 minute gap on the affected line. Two cancelled trains trigger Minor delays and three cancelled trains trigger Severe delays. A gap of three times the normal headway automatically triggers Minor delays all by itself. At its most extreme, there can be a gap of 29 minutes on the Hammersmith & City line and the service status will still say Good service. The Victoria line is the next simplest... and it's not simple. Ouch. Perhaps it's easiest to consider this the other way round. If you see Minor delays on the Victoria line off-peak, this could mean a 15 minute period with long gaps between trains, it could mean a 10 minute period with trains being turned back early, it could mean 5-10 minutes with no trains moving or it could mean only 70% of the timetabled trains are in service. If you see Severe delays on the Victoria line during the rush hour, this could mean a 15 minute period with very long gaps between trains, it could mean a 15 minute period with trains being turned back early, it could mean 5-10 minutes of no trains moving or it could mean less than three-quarters of the timetabled trains are in service. Service status is a catch-all headline with a myriad of possible causes. I won't delve into the intricacies of the other tube lines because they're even more complicated. Every other line is divided into central and peripheral sections, with different rules for each as well as different rules at different times. For example on the Central line any 10 minute stoppage between White City and Leytonstone triggers Severe delays, whereas that takes 20 minutes on the rest of the line. The furthest branches of the Metropolitan line stay on Good service for longer when trains run slowly, but move to Minor delays more quickly when there are cancellations. Night Tube services have their own rules - for example here's the Piccadilly line. One missing train, i.e. a 20 minute gap, still counts as Good service. A 30 minute gap is only Minor delays. Meanwhile it takes a full hour of stoppage for the Night Tube service on the Piccadilly line to be deemed Suspended. This might be worth knowing if you're ever trying to get home in the early hours. If you're interested, the Freedom of Information request also includes the official Service Status Criteria for the DLR, Trams, TfL Rail and the Overground, each of which takes a slightly different approach. As a final example, if you see Severe delays on the Overground this could mean trains at a stand on the main East London Line route for over 20 minutes, or at a stand for over 30 minutes on any of the other lines, or a gap in service over 20 minutes on the main East London Line route, or a gap of three times the line frequency on any of the other lines, or a train running over 30 minutes late or two consecutive trains cancelled or two consecutive trains turned short on any of the other lines. Basically, Severe delays on the Overground tells passengers bugger all. The system behind these Service Status Criteria may be complex, and a blunt-edged tool, but has at least been designed to be objective based on hard data, and to avoid unnecessary escalation. And that's why you might see or hear a Good service being announced when the immediate evidence looks somewhat different. Minor delays aren't always that minor, and Severe delays can be particularly severe.